The present value QUALY gains associated with a new drug that by 2010 could delay disease onset by 1, 3, and 5 years. The dollar value estimates range from approximately $0.7 trillion, for a 1 year delay in Alzheimer's disease onset for all new cases from 2010 to 2050 (QUALY valued at $100,000), to almost $4 trillion, for a 5-year delay in Alzheimer's disease onset for all new cases between 2010 and 2050 (QUALY valued at $175,000). The present value QUALY gains associated with a new drug that by 2010 could delay disease onset by 1, 3, and 5 years. 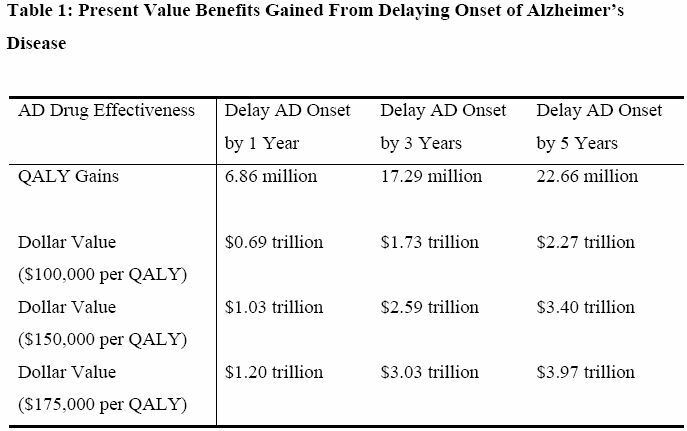 The dollar value estimates range from approximately $0.7 trillion, for a 1 year delay in Alzheimer’s disease onset for all new cases from 2010 to 2050 (QUALY valued at $100,000), to almost $4 trillion, for a 5-year delay in Alzheimer’s disease onset for all new cases between 2010 and 2050 (QUALY valued at $175,000).